Taylors Training has years of experience delivering DVSA approved Heavy Goods Vehicles (or HGV) training courses. Whether you are starting out, have had your licence for some time and require a refresher course or want to upgrade your licence - we can help. HGV refers to the category of vehicles in the highest of the LGV licensing categories for professional drivers. It is usually for vehicles over 7.5 tonnes with trailers heavier than 750k. 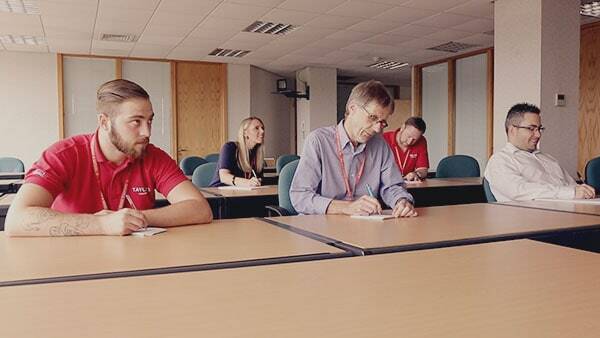 At Taylors Training, we always try to exceed our HGV Training customers’ expectations. We are proud of our modern approach to training which places value on the individual needs of each candidate. Training is built around those needs to give a personal and rewarding experience which leaves customers satisfied and achieves high pass rates. Each year we have a small number of sponsored places ﻿available﻿ on our HGV Training courses. Please contact us to find out more about ﻿the﻿ ﻿criteria﻿ we use to assess requests for funded places. Not sure? Talk to one of our support team who are ready to answer your questions. We offer varied training schedules which are tailored to your individual requirements. Weekend and public holidays HGV training can be arranged at no extra cost to provide a positive learning environment that will encourage you to perform at your best. Taylors Training will work pro-actively to help you achieve your goals. You will receive the best quality HGV Training and we aim for you to leave us being thoroughly happy with the service. Taylors Training offers comprehensive Large Goods Vehicles training courses tailored to our client’s individual needs for a future career on the road. We promise to take the stress out of LGV driver training and obtaining your licence. Taylors Training offers DVSA accredited training for drivers who want to gain a Category C licence. It qualifies drivers to operate vehicles including tipper trucks, refuse lorries, articulated lorries and the heaviest of box trucks. Taylors Training offers DVSA accredited training for drivers who want to gain a Category C+E licence. This is the highest of the LGV licence classes. Only drivers that obtain this standard can operate the largest and heaviest HGV and construction equipment on the road. Not sure if it's right for you or need some prices? Call or use the form below to talk to our friendly staff.